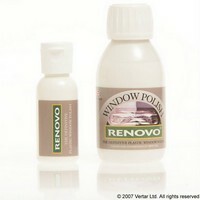 Renovo Clear Plastic and Window Polish is a great one step cleaner and polish that will remove or reduce clouding, fine scratches and help restore the transparency to all clear plastic. Shake the bottle well and apply a very small amount to a soft, 100% cotton flannel or Blu-Velvet Microfiber buffing/polishing cloth, work into the surface with moderate pressure, until all that remains is a faint haze. Burnish to a shine with another soft, 100% cotton flannel or Microfibre buffing/polishing cloth. Some areas may require 2-3 applications. Use on convertible rear windows, lens covers, brake lights, headlight covers, motorcycle fairings, airplane windows, bug deflectors, helmet visors, Lexan, Plexiglas, acrylic, etc. The absolute best product we have found to remove the "hazing" from clear plastic headlight covers. If hand application does not remove the clouding, Renovo Plastic Polish may also be applied with a small buffer or electric drill and a soft foam buffing pad. Burnish to a shine with a soft, 100% cotton flannel or Blu-Velvet Microfiber buffing/polishing cloth. Absolutely astounded. Didn't think it would work, but it did. Reduced major scratches too. Saves me the minimum of £140. Nice one, highly recommended to anyone wanting to renew rear plastic window on convertibles. I purchased my wife an Audi Convertable and the rear window was totaly opaque, you could see nothing out the back atall. I purchase a small bottle of window polish which arrived very quickly, and two hours later having cleaned the inside and outside the window is almost as new. A truly excelent product which i will be highly recomending. I still have enough left to do at least two or three more cleans when needed. Tried this on my 10 year old Z3 and it's great..I can see through the rear screen whereas before everthing was a blur. "Many thanks, the car covers arrived safely and fit the cars perfectly. "